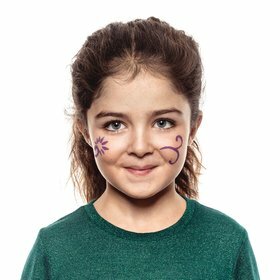 Take your purple Brush Pen and carefully paint flowers and swirls in the middle of the cheeks. The clever nib should help make this a doddle! Now for some floral details. 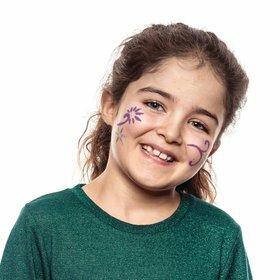 When you’re finished with the purple paint use your silver Brush Pen and add smaller flowers, stars and dots around the purple details you created in the previous step. Now you have your outlines, it’s time to decorate them, with the pink Brush Pen embellish the shapes with smaller details like dots and petals to create a blooming great floral face. Snazaroo Brush Pens give everyone the flower power! 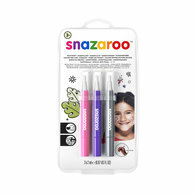 Conjure up fairies, princesses and butterflies with purple, pink and silver in the Snazaroo Fantasy Brush Pen Pack. Now it’s easy to give every face the magic touch! 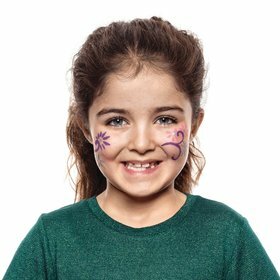 Snazaroo Brush Pens make face painting quick and easy with no separate brushes or water required for clean, tidy painting on the move. Great for big areas and detail, the 12 colours are suitable for sensitive skin and easy to remove.